This digital radio repeater is an outdoor wireless booster with heavy duty weather proof design. It can transmit and extend cellular signal to longer range. With SDR technology, the sub-band and channels can be easily tuned by software to adapt to the operators' requirement without any change on the hardware. It provides cell coverage for 2G(900MHZ), 3G(2100MHZ), 4G(1800MHZ) networks in the areas with poor or no signal at all. 37dBm, 40dBm, 43dBm are available. 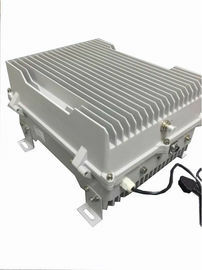 The VHF fiber optical repeater amplifier is applied to VHF interphone communication system and trunking communication system signal coverage extension. It is also known as “VHF Fiber Optic BDA”. 4. Perfect remote and local network monitoring function. 5. Waterproof design work for all weather indoor and outdoor. Fiber Optical Repeater amplifier is suitable for installation in place of laying fiber optic cable, and fiber optic cable distance should not exceed 10km. Wireless-Access Fiber Optical Repeater: Receives BTS signal via a Donor Antenna (applicable when no fiber optic cable connecting to the BTS).It can be sorted into 2 sub-categories: Band-Selective and Channel-Selective.